Nicotine can harm developing brains, experts say. Nicotine exposure from e-cigarettes may damage the developing brains of infants in the womb, as well as the brains of children and adolescents, suggests a new review of nicotine's effects. Animal experiments have shown that exposure to nicotine can harm developing lungs and brains, according to the review's senior author Dr Tim McAfee, director of U.S. Center for Disease Control and Prevention's Office on Smoking and Health. The harm in the animal brains occurs in areas involved in thinking and language development, and short- and long-term memory, he said. Dr McAfee said that manufacturers contend that e-cigarettes are safe because they release harmless water vapor. However, that vapor contains nicotine, which can be inhaled by kids who are near people using these devices. Children can also be exposed to nicotine from surfaces where it has accumulated from the vapor. If children touch those surfaces and then place their hands into their mouths, they can potentially be exposed to nicotine. However, it should be noted that most of the studies in the review don't look specifically at e-cigarette use. Instead, most looked at the effects of nicotine exposure on animals and humans from other sources, such as cigarettes or chewing tobacco . 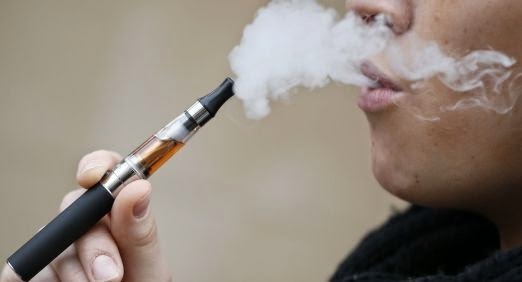 So, it remains unclear exactly how much nicotine exposure developing babies, children and teens are getting from e-cigarettes, as well as what the potential harms are from that exposure. The amount of nicotine an e-cigarette delivers depends on the type of e-cigarette, Dr McAfee said. The nicotine dose can range from as little as the equivalent of half a cigarette to as much as a whole cigarette, he said. Dr McAfee acknowledged that e-cigarettes may help people trying to give up cigarettes. "Although e-cigarettes have some benefit among adult smokers if they are used as a complete substitute for all tobacco products, e-cigarettes should not be used by youth and adult non-tobacco users because of the harmful effects of nicotine and the risk of progression to other forms of tobacco use," he said. The devices also shouldn't be used by pregnant women or teens, according to Dr McAfee. In pregnant women, the developing fetus is exposed to nicotine from e-cigarettes because the mother's blood is shared with the fetus. And, teens using e-cigarettes can become addicted to nicotine, which can damage their developing brain, Dr McAfee said. "We have to start taking steps, particularly to protect children and teens and pregnant women from the negative health effects of nicotine on the developing brain," he said. Gregory Conley, president of the industry group, the American Vaping Association, agreed that pregnant women should avoid nicotine in any form, "While the use of smoke-free nicotine products is generally far less hazardous than smoking , pregnant women should refrain from using all nicotine products, including FDA-approved products like the nicotine patch and gum." Dr McAfee noted that pregnant women aren't the only group the researchers are concerned about. He said that over the past couple of years there has been an epidemic of TV advertising glamorizing the use of e-cigarettes. "There is an explosion of e-cigarette use among our youth that we are greatly concerned about," he said. Dr McAfee added that there should be restrictions on advertising these products to teens and price increases to discourage teens from buying them. "The FDA is attempting to regulate these products, but has not yet done so," Dr McAfee said. Conley took issue with the potential motives of the review's authors. "Regrettably, it appears that this review was primarily written to give the authors a platform to make policy recommendations that would be useful in federal and state lobbying efforts by activists who oppose e-cigarettes as a way to reduce harm from tobacco by adult smokers," Conley said. But others felt the review provided crucial information. Vince Willmore, a spokesman for the Campaign for Tobacco-Free Kids, said, "This article provides an important and timely reminder that nicotine exposure can cause lasting harm to the health of young people whose brains and lungs are still developing." "The report also provides further evidence to support increasing the age of sale for tobacco products to 21. We should be doing everything we can to prevent youth use of any tobacco product and prevent and reduce tobacco use during pregnancy," Willmore said.